Today we are going to continue our series on beach science by looking at sand. Although not all beaches are sandy, if you are lucky enough to visit one you can do some interesting science activities and experiments. 1. Where does sand come from? Find a tough metal or heavy plastic container with a tight-fitting lid. Add some relatively clean pebbles inside (a mix of different kinds works best). Close the lid tightly and let the kids shake it for as long as they want. Even after a few minutes, if you pour the pebbles onto a white piece of paper you will begin to see chips of rock that have broken off. Or if your child has some rocks in a rock collection that have been jumbled together, you will often see “sand” starting to build up in the bottom on the container. When rocks bang against rocks they break apart. Now think about where rocks might tumble against each other in nature. Where might sand form? One of our favorite exhibits at the local Arizona Mining and Mineral Museum shows different types of sand from “an ant’s eye view,” that is magnified so the grains look like boulders. When you pack for the beach, consider taking a sturdy magnifying glass to explore the sand up close (and any creatures you might encounter). A Grain of Sand Picture Gallery. Wow! These pictures are from a book of the same title listed in the books for adults and older children below. Quite by accident we discovered that if you roll a magnet through sand, you can pick up bits of particles that contain iron. Note: it is really hard to get the iron bits off again. Put your magnet in a plastic sandwich baggie and it will make clean up much easier. 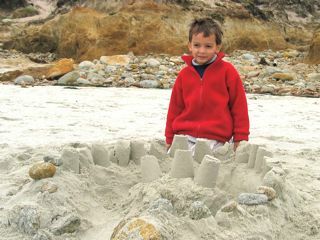 You'll be amazed at what your children will pull out of the sand. 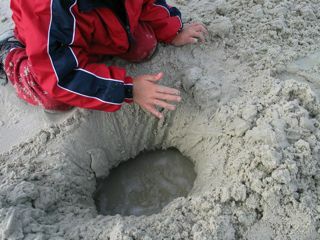 Sand and water play is so important for children, even older ones. All you need are a few buckets, old plastic tubs and maybe some shovels and you have the recipe for some serious study. Hey, there’s water down there. Is there a trip to the beach in your future this summer? Although trips to the beach are mostly pure fun, that doesn’t mean you can’t include a little science. Prepare for seashore science activities ahead of time and your children will have even more to discover when you get back home. What do you usually see at the beach? Of course you’ll see sand, rocks and water. If you are lucky you may also spot some wildlife and algae. Over the next few weeks we are going to have a series of science discussions, experiments and activities on things you find at the seashore. 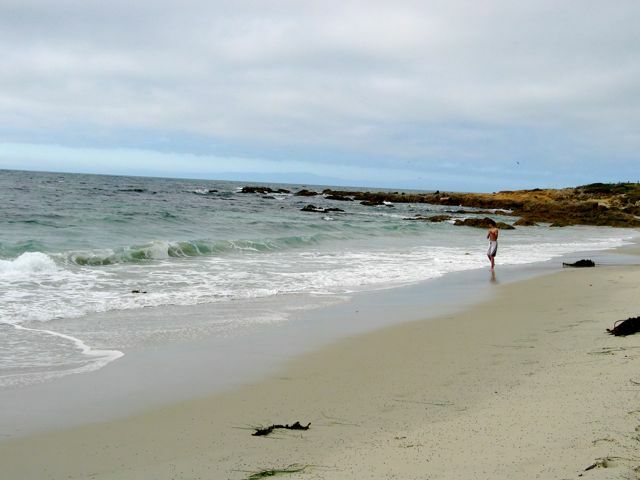 It doesn’t take long at the beach to discover that seawater is salty. You can taste the spray on your lips. Ever wondered why seawater is salty or what is in it that makes it taste salty? There really is science in seawater. One easy experiment is to take along some pH paper and check how acid or basic seawater is. Compare it to other substances and to tap water. Typically seawater is basic, that is higher than 7.0. Seawater pH is an important aspect of its chemistry because it impacts such processes as the laying down of calcium by corals. With the help of an adult, bring one cup of seawater in one pan and one cup of tap water in another pan to a boil. Turn down the heat and simmer until the water is almost dry. Watch carefully. Try not to let it boil completely dry because that will harm the metal of the pan. Remove from the heat and set in a warm place to finish evaporating away the water. What’s left? Optional: in a third pan place tap water and add a Tablespoon of salt. Boil as above. What happens when you evaporate the water in this case? You should see a residue in the seawater pan. Pretend you are a chemist. How would you figure out what is in the residue? One way is to do a flame test. When different chemicals are added to a flame, the resulting colors can give you information about what salts or elements are present. Here a trained chemistry teacher shows how this works. Using flame tests and other techniques, scientists have found over 70 elements in seawater. How did those elements get into seawater? When I was young, I learned that the movement of freshwater over the earth’s crust picked up salts and carried them into the sea. Over time the salts built up because they are left behind when the water evaporates to move through the water cycle. When I watched Going Deep on Scientific American Frontiers I found out that isn’t the only way salt gets in the ocean. About thirty years ago, deep sea explorers found features known as hydrothermal vents along mid-ocean rifts. These are places on the ocean floor where seawater seeps into cracks in the crust. The water becomes extremely hot when it comes into contact with magma under the surface. It can’t boil, however, because of the extreme pressure at those depths. It dissolves some of the minerals from the crust and then flows back up into the ocean, carrying the dissolved minerals with it. Scientists have figured out that these vents are a significant source of the salts in the ocean. A final process that provides salts to the oceans is the eruption of volcanoes under water. This is similar to the vents because the seawater is reacting with hot magma and lava, and dissolving some of the minerals in the liquid rocks. Seawater is fascinating stuff and we still have a lot to learn about it. Hope you have fun at the beach and watch out for those waves! Note: the linked page has some video clips.